Travel, bikes, rallies and dodgy mechanics. Hellas was my first real rally; the closest I have done before was the Horizons Unlimited Mountain Madness event in Spain – which was much more of an orienteering exercise than a rally. I’m going to describe the experience from my point of view as a rally virgin, for people who are considering taking part in a similar event. I found it to be a seriously intimidating prospect; an actual off-road motorcycle race. My hope is that this article answers some of the questions that any readers might have – possibly reducing some of that initial fear I felt. Not wanting to charge off completely half-cocked (for a change) I did a fair amount of prep work. Lenore got a little love; she was blessed with a new Rade Garage tower to carry the navigation equipment. Rade’s discount for Hellas participants helped. I flirted with self-build and Jakob Weinkencht’s electronic roadbooks but decided to go with the mechanical, proven option from F2R with an ICO RallyMAX-G trip meter. The installation of the kit is pretty simple; it’s all in the instructions and I didn’t make any major changes aside from drilling a few holes in the tower to fit switches and power sockets. Fitting the controls on the 701’s handlebars is a bit of a compromise while keeping the sock 701 switches, but it’s possible if you move the clutch inwards a little. Tight, but it works. As I was taking part in the Lite version of the rally I was allowed to have my GPS, I fitted it to the second ICO position above the roadbook holder with a RAM mount. I wouldn’t do that again – it wobbled about so much that the Garmin bracket broke. I treated myself to an upgrade as well; I booked in to Stefan Hessler‘s roadbook training course. I can’t say enough things about the training or the man himself. We started off not by reading a roadbook but, after a little theory, we wrote one. A blank roll of paper was fitted to the holder, a pencil strapped to the handlebars and off we went. We made our way through a list of towns and villages and stopped at every junction or noteworthy point to note down instructions and distances. The students then swapped roadbooks and followed each other’s efforts. The remainder consisted of following Stefan’s roadbooks and by the Sunday afternoon I felt confident I wouldn’t get too badly lost. For those of you not familiar with roadbooks they’re not rocket science, but they do take some getting used to. It’s a paper roll with distances in one column, a picture representing a junction or obstacle in the second column and warnings in the third. You navigate by keeping track of how far you have gone; with the trip meter. It’s pretty simple until you make a mistake, when you’ll need to think on your feet to avoid getting lost. I won’t waste your time describing in detail how they work here, the best description I have seen is Lyndon Poskitt’s on-board commentary from Rally Mongolia but YouTube has plenty of examples. 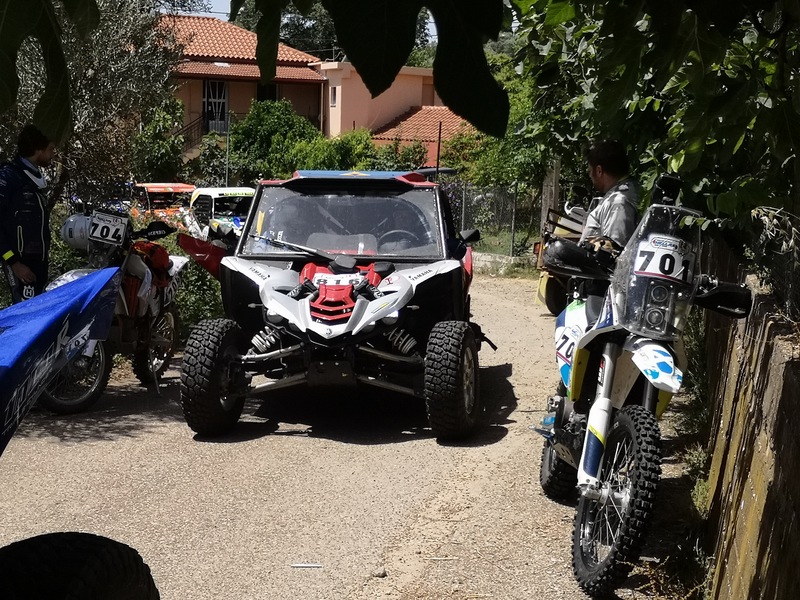 I entered the “Rally Lite” class which was described as being a slightly shorter version of the main rally, with the participants given the route for the day as both a GPX file and paper roadbook. I promised myself I would only use the GPS if I got lost but I did find myself checking it from time to time, to make sure I was “on track” during days one and two. Mid-way through day three my GPS bracket broke and I couldn’t use the GPS any more; my pace increased dramatically when I was left with just the roadbook. There is a reason the professionals navigate this way; it’s quicker and a lot more enjoyable. Resist temptation; avoid the satnav. Registering for the rally is a simple enough process. The sooner you do it the less you pay. You need to provide copies of a few key documents – license, insurance, vehicle papers. Some things are not made completely clear on the site; amateurs do not need a race license from FIM for example. Meletis and his team are helpful; if you have any questions they tend to answer them fairly promptly. Getting to the event doesn’t take any great imagination, I transported Lenore there on my trailer. A few rode there, most had their vehicles transported to the rally with rally service companies like Desert Rose – who’ll take your bike to the event and provide support; fixing up your bike in the evening and presumably providing other services. I shacked up in the cheapest hotel I could find; after a days racing any bed will do. While I am discussing admin it’s probably worth talking about costs the costs of participating in an event like this. These are only rough costs, I have not included replacement parts or my rally fairing for example only the things you will definitely need to be able to take part. Count on twice this if you use mousses. So you’ve signed up, your bike is ready, roadbook holder installed, your skills are polished, body hale and hearty, you’re at the bivouac and utterly overwhelmed by all the pro teams and their big trucks. What next. At Hellas 2018 the whole town of Olympia was the bivouac, the race organisers were at one end of the high street and notice boards were all over town town. The boards provide information on what’s going on; days and times for registration, technical checks and the first briefing. There is a briefing every day; it’s absolutely worth attending – important information like route changes and cancelled stages will be announced here first. The registration and technical check day was, for me, a little chaotic. No real advice is given about this, you’re left reading the boards and asking questions of your fellow riders. Personally I think an optional briefing that morning might, for those who don’t know the drill, be a very useful thing. The next day – the day before the race – you have two jobs. Paperwork and technical inspection. Your IDs, driving licenses and insurance are checked and you sign all the disclaimers you need to sign. The tracking devices are handed out – at Hellas 2018 they were small USB-charged units you carry in your pocket. Other races use equipment you need to connect to your bike’s electrical system. You’re also given the paperwork for your technical inspection. Once you have the paperwork you take it and your bike to the inspection station. They’re looking to make sure your tyres are (nearly) new and that everything is basically in good condition. Floppy chains, leaky exhausts, oil leaks, exhaust smoke, broken lights, no indicators – all of these things could fail your bike. Other strange ones include actually having a normal solid number plate – you have to take a copy and laminate it, then attach that to your bike. Once it’s checked they sign the form, put a sticker on your bike and you’re good to start the next morning. If you’re like me you’ll plan to do all your final prep on the day of the inspection. I knew GoldenTyre had a van present to sell (and install!) tyres and mousses; so I didn’t bring any. They had my beloved GT723 tyres but had just ran out of mousses; so I ran the whole race on tubes. They have a near unlimited supply of tyres for the smaller bikes but if your bike is not a KTM 450 don’t rely on them having what you need. I also did an oil and filter change on the day of the inspection; fortunately I did it after having had the bike inspected. I managed to strip a bolt on the large oil filter cover and started the race with said cover held on with a great glob of two compound metal. It worked well, thankfully. No threads, no helicoils, no problem. Much easier when someone else does it. It’s worth mentioning that you do get to carry a mobile phone with you. For the “Lite” participants at least it wasn’t in a tamper proof bag; we would have been allowed to use it’s navigation features anyway. In the full rally they were also to carry a phone for safety; I don’t think they had to use a bag for it – I believe they were just trusted not to use it as a navigation aid. You carry the little tracking device with you at all times, charging it up at night – it tells the organisation where you are (yay!) and gives them a mechanism to penalise you for speeding (boo!). There’s another briefing the evening after the inspections roadbook changes are posted, everyone goes to their hotels, marks up their roadbooks and gets a good night’s sleep. …marks up their roadbook appropriately. This is the key for the roadbook, impossible to remember it all. Before I start the story, I will explain the notation I used above. “T” is for Transfer, the journey from the starting point in Olympia to the start of the timed section – 16km on day one. That timed section is called a “Special Stage”, hence the “SS” notation which was 96km. The way home, or the way between two Special Stage starts is called a Liaison, hence the L and was 55km on the first day. You have to obey the speed limits on the roadbook during the non-timed sections or you’ll get penalties; as a rule they’re on normal roads and use the fastest route to get you there – it’s all on the roadbook though. The first start of the day is a pretty relaxed affair, the Lite riders go and pick up their GPS from the organisation – loaded with the day’s track – then head to the start point a few minutes before their designated start time. You fuel up, if you need to, and chat with your fellow riders. As your time approaches you put your helmet on and get ready to go, passing your time card to the staff who mark it with your real departure time – which could be later than your assigned time if there have been delays. At the designated moment you are waved through the start line and head off on your way to the special stage start. You’re not being timed here and you are penalised if you break the designated speed limits, so the reality is that you head to the start point in a blob with the other riders in your class. You have plenty of time to get to the start, there’s no rush at all. Every day starts at the BP petrol station. The Lite blob made it to the start of the special, where we found staff from the organisation and other riders waiting to start. It follows the same pattern as the day start – you hand over your time card to an official and they write down your start time. They let you through the gate at exactly that start time. But it’s a whole other experience; the air is filled with dust, you and your fellow riders are – especially on day one – filled with nerves, the competitors leaving before you tear off across the start line at speed. Rather than being waved gently on at the start you’re given a countdown from 5, 4, 3, 2, 1 and the race is on! Hanging out with the SSVs at the start of the stage. The stage itself was, aside from the dunes which were yet to come, the most technical stage of the rally. There was a lot of rough terrain and the highlights were a deep, rocky river crossing and a ride up a mostly(ish) dry(ish) riverbed. Lenore, as much as I love her, wasn’t an asset here – the lighter bikes had an easier time and the terrain we covered was more challenging than anything I have ridden before. For most of the stage I was completely alone; occasionally passing other riders and occasionally being passed by them. The lads riding supported by Desert Rose (712 Alex Collyer, 713 Perry Newton and 714 Gavin Dickinson) were my most frequent companions, they’d tear on past me on their smaller bikes and superior riding skills. The funny thing was that they seemed to do so repeatedly throughout the stage – I had a feeling that navigation rather than raw speed was going to be my one advantage in the competition and these guys were proving me right. They were repeatedly getting lost but I was plodding on, following the roadbook carefully. I must, however, admit that did check my satnav more than I would have liked to, it’s hard to resist the temptation to look down and just check you’re on-course. The river was the first major challenge, I approached alongside fellow 701 rider and Lite competitor – 705 Gerald Weber. We both stopped a moment to size it up. Gerald elected to walk his bike through, I stayed in the saddle but took it slowly, my lack of experience and paranoia about my lowered wading depth from my Rade fuel tank preventing me from hitting it with confidence. I wish I had; my crossing was neither fast nor graceful – but I made it. On the other side I found 717 Frank Radek, with his seat off and his fuel tank removed – he’d dropped it in the water and needed a spark plug socket to drain his engine of water. I had packed one that morning – the wrong one! Sadly I couldn’t help. I was, however, now even more pleased I had stayed the right way up.! Shortly after the river crossing we hit the first of two major riverbed sections in the rally. It was hard going; extremely uneven and slippery – strewn with rocks and branches. You had to pick your line very carefully and I elected, again, to take my time about it. Slow and steady was going to win my race, or so went the strategy. I made it through the section without a hitch, a few scary moments but again Lenore stayed upright. The stage seemed to be over surprisingly quickly and reaching the end at kilometre 96 was more a disappointment than it was a relief. I passed through the finish line, handed over my time card and they wrote my arrival time down. Then it was just the liaison back to Olympia, where you hand your card back to the officials and your GPS back to the organisation. It takes a while for the race timings to be announced, the organisation have to compile all the data from the time cards and add speeding penalties. I got on with checking the bike and grabbing some food. When they did I was, initially, rather shocked. I had put in an unexpectedly good performance on the stage but was in last place due to speeding penalties during the road sections! I decided not to quibble, even through the penalties were extreme, putting me firmly in the lower half of the Lite standings. I had broken a few speed limits and I wasn’t there to win. The orga had enough on their plate without some chump in the amateur class complaining about his times. We’d all made it though though, except 706 Ewald Eicher, who had come off and given himself a concussion – he didn’t ride in the event again. I attended the evening briefing and got some sleep, the next morning necessitated an earlier start. I woke to a shock, I looked again at the rankings for the previous day and was thrilled to see that my speeding penalties were gone. I was in 4th place in my class! The starts were organised by class, with the elite riders leaving first – and very early in the morning. Most mornings we were released between 0900 and 1000 and this one was no exception. We’d been told that this was the first of the dune stages this year. A short distance west from Olympia were endless beautiful beaches, I’d spent a night on one whilst on my way to the rally. We had special permission from the local government to ride on the dunes, but as the area closer to the sea was a nature reserve there were specific rules we had to follow. We were proudly told that we were the first international rally anywhere to ride on the dunes of a nature reserve. Meletis had been explicit about this at the briefing the night before; we were not – under any circumstances – to go on the beach itself or to venture any further towards the sea than the roadbook specifically mandated. The following day we were told that we are the last rally to ever be given permission to ride the dunes of a nature reserve. A number of riders had been filmed riding on the beach. All subsequent dune stages were cancelled. This was a good thing for me and Lenore but does constitute my first major gripe about Hellas 2018; the riders who rode on the beach were not – to my knowledge – seriously penalised. It would have been better for the image of the sport if they had been disqualified, this consequence should have been made very clear to everyone before the start of the stage. The GPS system and photos taken by locals could easily have provided evidence. The first special stage was, for me, uneventful. Easy tracks and simple navigation, I was happy with my performance on the stage but was very apprehensive about the upcoming dune stage. Lenore is a beauty but she’s carrying a few more pounds than those 450s and her footwear, while perfect on firmer ground, isn’t ideal in the sand. No choice but to give it my best though. The stage started down by the sea in the grassy dunes – the going was good but the navigation was tough. This was the one occasion where I did group up with some other riders – who promptly got lost. We managed to find the route again and ever since I elected to stick with my own navigation skills, rather than relying on others. I found a few others, including 700 Jakob Weinknecht, 703 Stefan Hartl and Team Desert Rose at the base of a dauntingly large dune and stopped for a moment to size up the situation. The Rose boys were living up to the “Desert” name and trying to get to the top, I threw myself into it in second gear with a huge amount of throttle and a lot of swearing and – somehow – made it to the top before coming to a stop. First time. I was ecstatic. I looked back down the dune to see Perry trying to emulate my success, and failing spectacularly – nearly throwing himself over the handlebars. No harm was done – he attacked it again and promptly overtook me! The route at this stage followed the top of the dune for a few kilometres. Some hard, sadistic, kilometres. I’d never ridden in sand like this before, it was bone dry and fine. I simply could not maintain a pace that kept me above the sand and fell off every few hundred meters. I made it to the end of the dune but was utterly exhausted, having to stop under a tree for longer than I would have liked to hydrate and recover my strength. I pressed on with the stage and soon met up with Stefan, who had skipped the big dune climb. We rode together on an easier section then crossed a railway and headed back into the dunes; he got stuck on a climb but I made it to the top. I came back down to dig his Yamaha out of the sand and helped to haul him to the top. Again it was dry, loose sand and we both came off regularly. 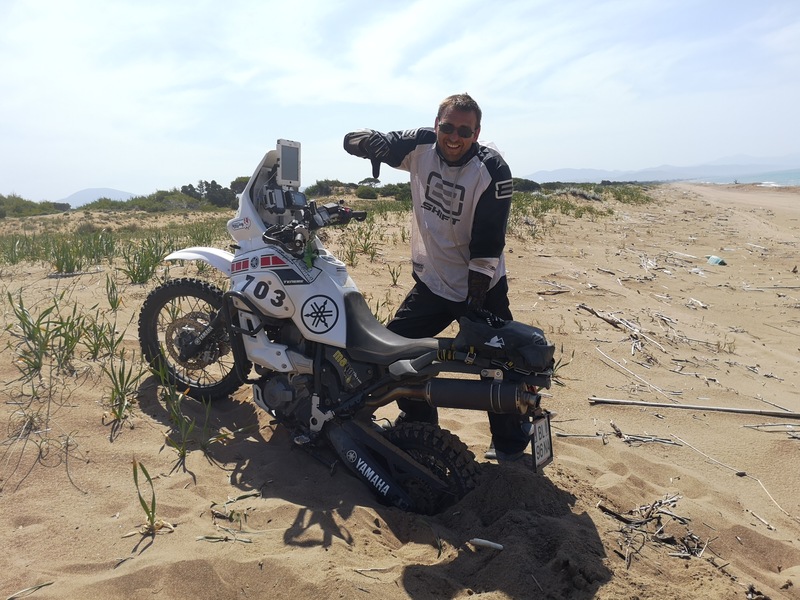 Eventually we decided to abandon the dunes, both of our bikes were too heavy and our skills too limited – we made our way to the road knowing that we would be penalised but that it was a better option than continuing in the dunes. Neither man nor machine would have survived. One machine did not survive – Lenore. As soon as we hit tarmac I found I was unable to go any faster than 80kmph, my engine was hotter than Satan’s ring after a vindaloo. I’d burned my clutch out. We made it back to the stage and the start of the next mountain section but my bike was struggling with hill climbs on tarmac, I called the organisation and bowed out of the stage – I would be penalised but as I had started the stage I was not disqualified. I made a few calls and headed for the nearest KTM dealer, who had a new clutch for me. They switched the clutch cover with a spare from a KTM 690, so Lenore now has a black engine on one side and a brown one on the other. Very stylish, frankenbike. As a result of the visit to KTM I was back at Olympia very late indeed, the dealer was 125km away. I attended the briefing, marked up the roadbook and collapsed into bed. I wasn’t quite so pleased with my results for day two. This was the last truly memorable day for me, at least until the final day, and provides ammunition for my second major gripe. This was one of two days where the Lite participants were to follow a different course from the main rally. We were only to do SS1 and SS3. This had, apparently, been communicated to the riders using electronic roadbooks but not to those of us who simply picked up a set of paper rolls. Communication for those people not doing the main rally was poor, the Adventure class also suffered from the same lack of attention. This is being rectified in 2019, where Meletis has asked Marc Collins to organise both of these classes – so Meletis can concentrate on the real race. This is a much needed change and I am confident it will dramatically improve the experience of novice and adventure riders in subsequent versions of the event. The first stage was fairly normal Greek mountain trails. Some rougher stuff, but nothing too alarming. 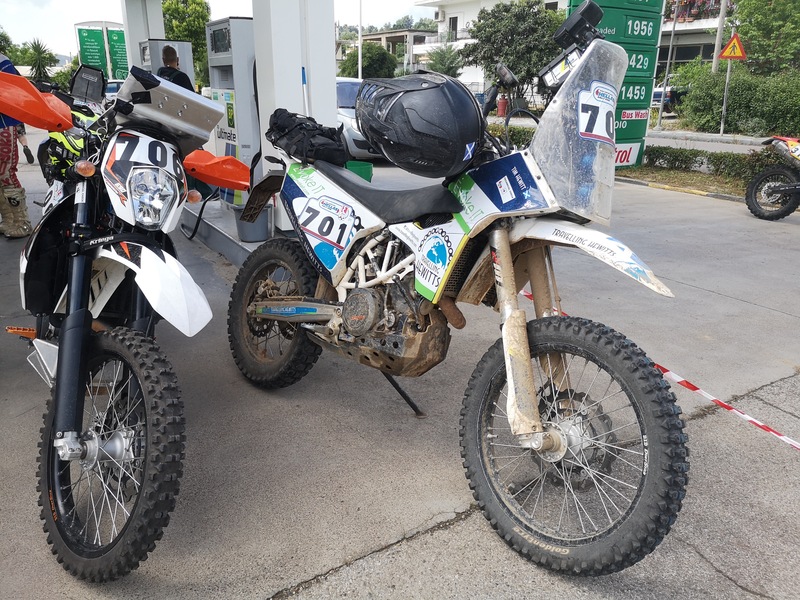 The first liaison took us back to a service area – all the rally service companies were encamped at a big petrol station with spare bits and supplies for the supported riders. I didn’t have a support crew, but I did make a friend – the youngest daughter of the station owners, who kindly helped me switch my roadbook for SS2. They’d put on hot food and had ample supplies of cold drinks, so the hour and a half spent chilling there was pleasant respite. Hot food at the service stop. My pit-crew, helping load the roadbook for SS2. Then it was on to SS2, for some of us. It did seem strange that we still had such a long way to go, so late in the day – a result of our late start time – but it’s meant to be an endurance event so I made my way to the start of the special. The organisation people there did the usual without comment and I headed on my merry way. What a stage it was; high in the mountains along tracks with utterly gorgeous views – but it was hard going and a long, long way. I rode most of the stage with an Italian from the main class, who had fallen behind due to some technical issues. We took it easy, enjoyed the views and even took a few photos of each other at the highest and most impressive points. It wasn’t the day for racing. It’s not all speed some views demand a pause. By the time we reached the end of the stage I was out of energy and it was so late that had I started SS3 I would have been racing in the dark. Although I knew that not attempting a stage is grounds for declassification I abandoned the day and went back to Olympia. When I got home I discovered that I was the only Lite rider to complete SS2, somehow everyone else had heard or been told that we were to do SS1 and SS3. Still, it had been a beautiful day and the orga honoured my time for SS2 as if I had done SS3. It didn’t stand me in good stead from a competitive point of view, but I was still in the classification. Definitely not very good at this. This one was an easy day. SS2 was cancelled and the first stage was relatively short.. I think some of the elite riders were back by lunchtime and I was back in time to do some repair work on Lenore and enjoy Olympia a little. I even took a swim in the hotel pool! So, so, so many trails! Olympia is usually a sleepy little place. It’s main reason for existence is the archaeological ruins next to it; busloads of tourists are dropped off – they visit the ruins, buy souvenirs, dine and so the life of the town continues. An invading armada of rally riders changed things a little; we all stood out from the tourists like sore thumbs. Dirty, exhausted, wearing KTM orange caps and riding loudly around town. I’d somehow picked up a nickname – which was being regularly shouted at me as I walked down the high street. It became the title of this website; blessings were given, the atmosphere was light, I think everyone appreciated the break. The fifth day took us up into the mountains again. For me this one is a bit of a blur, I vaguely remember forests and a tricky section crossing some rocks. The trails were tough, lots of changes in elevation and some horrendously steep sections – plus some which seemed to not quite be real trails, more headings over open ground. I was in a daze, routine had set in and I was tacking these challenges almost as if I was sleepwalking – on terrain that a week ago would have terrified me; it now seemed routine. The dune stage today had, thankfully, been cancelled – so it wasn’t quite the marathon it should have been. By this point some of my fellow Lite participants had thrown in the towel, either taking the day off or skipping one of the two sections. What I do remember was that this day was wetter than most, the tracks seemed to have been cut out of dark soil rather than out of sandy dirt. We crossed and rode though a few rivers, some of which required fairly alarming drops to get into and out of. One pool of brown water looked shallow enough but concealed a hole as deep as my thigh. I was damn lucky to get out courtesy of a reckless hand full of throttle. I was still riding alone, where the others seemed to be in small groups – I was happy enough by myself. I only had to pick my up own bike, which was happening more often now – always thanks to exhaustion and inattention in low-speed turns, seemingly never while I was actually in motion. I was still in a daze and was, to some degree, just wanting the whole thing to be over. Another day, another stage start. The crazy was starting to set in. On the way home I found my mind wandering, I was exhausted. Every part of my body ached and I had no motivation whatsoever to continue. I wasn’t looking forward at all to the next day, I had no desire to check the bike – again – once I got back home. To mark up roadbooks – again. So I started singing to myself, then I started with poetry. I’d passed a bike on the stage with a snapped swingarm and a line came to me; when I got back to Olympia I was inspired. I fired up my laptop and wrote this; my motorcycle had also picked up a name – Lenore. I woke for the final day a new man, my daze from the previous two days was gone and I was feeling energised and – like those Austrian bikes that are so very popular – ready to race. Which was all for the better because Meletis had an extra special surprise in store for us today. The transfer almost immediately departed the road network and took us into the trails. From the briefing I knew that a riverbed was involved and that it was going to be interesting. As I arrived at the entrance to the riverbed I double-checked my roadbook, I rode on a little to see where I had gone wrong. At the end of the trail I met one of the photographers, who suggested I might skip the next section by heading to the road. This section was optional and anyway, transfers are not timed. No harm, no foul. But I had come this far, what harm could come from one last challenge. Ahead of me were more rocks than I have ever seen, making up a wide riverbed that went on as far as the eye could see. To put it mildly – this took some getting used to. Lenore took some punishment. The new clutch case didn’t have a case protector, I never re-installed it. Going down to the left could easily have been fatal. The handguards got a workout. My knee armour proved it’s worth. I don’t know how many times I found myself sideways while I was getting the hang of bouncing along in this crazy place. I met a group of Israeli riders from the main rally, they were struggling but they were soldiering on like everyone else – having a great time. I clawed my way along the riverbed and to the start of the Special stage. Some of my colleagues in Rally Lite were sitting there, fresh as a daisy, having skipped the transfer. I’m not sure if I was sorry for them or envious. There was one final special to complete and then it was done. The opening kilometres of the stage still had an ambulance present, attending to one of the two victims of an earlier crash – the riders did survive but were badly hurt. It was a reminder that it’s a damned dangerous activity, you can come a cropper at any time. The route followed the classic Greek mountain trails that made up most of the rally to this point. Mostly good going, lots of loose rocks, some larger ones. The stage took us back over the river from day one, in the opposite direction. I didn’t suffer from the same lack of confidence as before, I was twice the rider that I was the first time around. Sure, I still got wet boots but I was over with markedly less fuss. The final kilometres took us along a valley and up a mountain. Our last checkpoint, where the time card was written for the final time was somewhere near the peak. The rally was over, but it didn’t feel like it. A few hundred meters more led to the other side of the mountain and a glorious view out to sea. Now it felt like it. I’d completed the vast majority of the competition alone and completely unsupported. I’d solved all of my own problems. I completed every stage I possibly could and overcame every challenge. I finished with only Lenore for company, on top of a mountain with a view so glorious that I could understand the inspiration for the ancient Greek gods. The roadbook took me on, down the mountain, towards the sea, towards the party at the beach. Someone forgot to tell them that the slowest competitors leave last and arrive even later. All the beer was gone, food in short supply. They were packing up and the finishers medals were handed out by an indifferent looking official – rather than the tightly clad models typically hired for such male-dominated sports. No matter – I took a swim in the sea and headed home. For Lenore and I the rally ended alone on the mountainside, not here. Only seven of us even started today. I scratched an itch by going to Hellas. I was incredibly excited by the crazy idea of me – the kid who couldn’t ride even a pushbike until late childhood – competing in an international rally. When I finished I wasn’t in any rush to go back; I discovered that I am much more a traveller than I am a racer. But I will be back; it’s a different kind of adventure – you’re not so much seeing a place as you are experimenting with your own limits. As time passes the idea grows, steadily, I’m a better rider, by far, as a result of this competition. Ultimately I finished in 7th place out of 15 Rally Lite competitors. I’m more than pleased. Can you tell us what were the temperatures like during the rallye? And what about your equipment? Happy with your Leatt neckbrace? What sort of armor vest, and knee protection did you use? You should! Tell Meletis I sent you? It was pretty hot, especially as Lite people left last and so got to ride in the hottest part of the day. I was wearing a bit of a hodgepodge of gear. From top to tail it was my trusty Shoei, I think I’d have been better with a cheaper motocross helmet, the Shoei is heavy and expensive for racing. I have worn the neck brace for years, it’s extremely comfortable and I rarely ride without it if I’m hitting the trails at all. Can’t recommend it enough. Chest armour was the Leatt flexible protection, the bigger more substantial one of the two. It’s great and I now use it for everything, on the street I put my Badlands jacket or a leather jacket over it. Racing and trail riding I’ll put a Motocross jersey over it. The pros seem to wear the harder stuff, but I wanted something dual purpose. The night I got back late I put a simple waterproof jacket on to keep the wind out, perfect. On my legs I just wore my Badlands trousers with the regular one protection, with Sidi Adventure boots. I did feel a bit under equipped there and maybe rode more cautiously as a result. I’ll be replacing the boots soon as the soles are falling off and will go for more serious protection. I’d love knee braces too, but good ones are horrendously expensive and the cheap ones I have tried are uncomfortable. It was all kit I already owned and used for trail riding, I think if your not pushing it hard then that’s all you need. If you plan to really push it then I suspect one of the more competitive guys would be able to advise on better gear.